Hiya, everyone! Look who it is! Yep, it’s our good friend, cauliflower, again. Because I CAN’T. GET. ENOUGH. of this cruciferous vegetable. And this crispy cauliflower salad is no exception. Did you know cruciferous vegetables are a powerful tool for women seeking better hormonal balance? This includes issues related to estrogen dominance (or low progesterone), PCOS, and other hormonal imbalances. Cruciferous vegetables contain a powerful substance called Diindolylmethane, or DIM. DIM binds to estrogen and helps to remove it from our bodies. It also supports detoxification pathways in our cells and liver that help break down and clear excess estrogen. As a woman with PCOS, I make sure to include several servings of cruciferous vegetables into my diet every day. And with the versatility of broccoli and cauliflower, it’s tough to get sick of eating them. From riced broccoli stems to chipotle cauliflower mash, the sky is the limit. 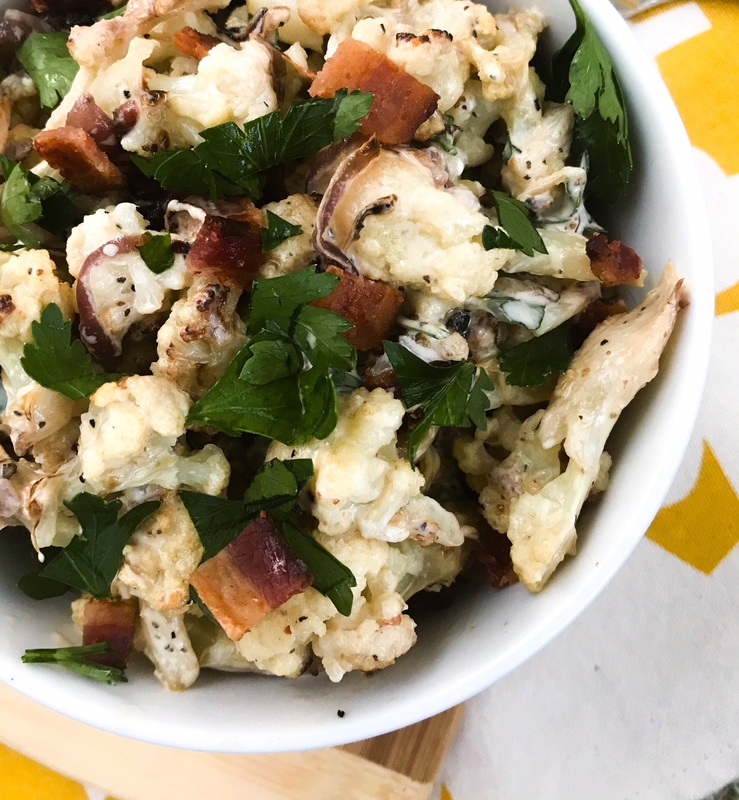 This Crispy Cauliflower Salad is a great, low-carb substitute for potato salad. It has all the tangy flavor of potato salad, without all the extra carbs. Dig in. Toss the cauliflower and red onions with olive oil, sea salt, and black pepper. Roast the cauliflower and onion at 425 until they get crispy and starts to turn golden, about 20 to 30 minutes. flipping occasionally. Meanwhile, combine the sour cream, honey, mustard, and vinegar in a small bowl. Remove the cauliflower from the oven and toss the cauliflower with the sour cream mixture. Then add the parsley and bacon and stir until everything is evenly combined. Serve warm or cold topped with avocado and/or extra chopped parsley. Leave a comment on this blog post. I would love and greatly appreciate your feedback, questions, and suggestions for this recipe. Please leave me a note in the comment section below! Thanks, in advance. You’re the best! I am not a doctor, and I don’t claim to be one. I can’t prevent, treat, cure or diagnose illness or disease. The information presented on this website is not meant to replace a one-on-one relationship with your health care professional and is not intended as medical advice, treatment or diagnosis. The purpose of this website is to share knowledge from my research and experience. I encourage you to make your own decisions regarding your health care based on your own research and relationship with your health care professional. I make a small commission from the product links above, although the price of the products stays the same for you, whether or not you purchase through my affiliate links. You can purchase these products directly from the sites if you don’t wish to use my affiliate links. Hi, I’m Candace Kennedy, a Certified Holistic Nutritionist. I work with clients across the globe to help them achieve their optimal health and learn to truly thrive. Through custom nutrition and wellness plans, you can take control of your health and live the life you were designed to. get recipes, nutrition tips, and research-backed recommendations for optimal health sent straight to your inbox. Copyright Candace Kennedy © 2018. All rights reserved.